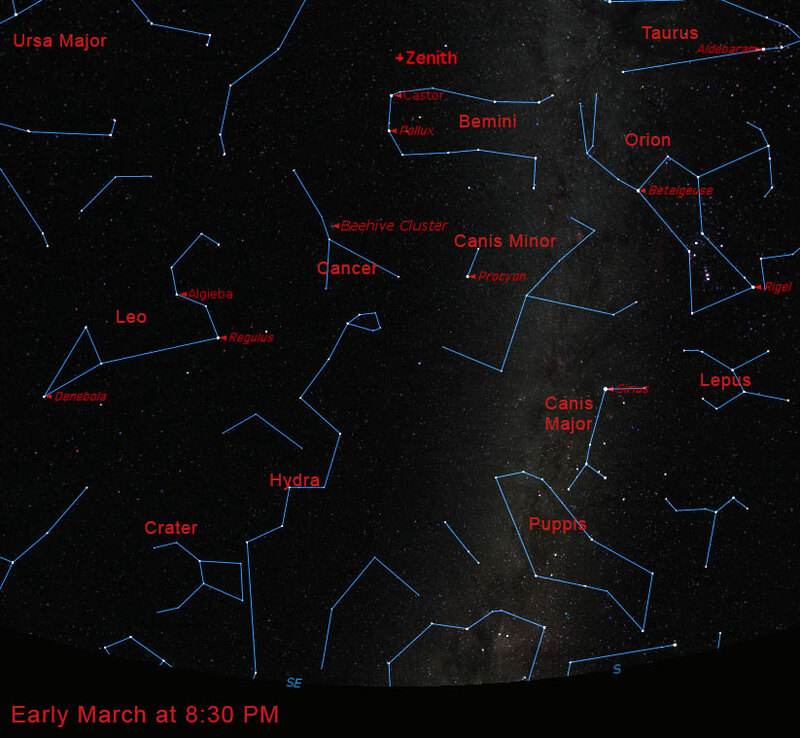 In the evening sky, the rising Leo constellation signals that spring is coming and it looks like the weather might be agreeing. Leo with bright Regulus at the end of the sickle part on the right and Denebola at the far left end is halfway up in the eastern sky by 8:30 p.m. (See the star chart below.) Orion and Canis Major are already past the meridian (due south line) by then. A line extended down to the left from Orion’s belt points you to Sirius, the brightest star in the night sky, at the nose of Canis Major. For a long time I thought that the sickle (backward question mark) part of Leo was the tail of the lion and what a magnificent tail it was! It wasn’t until I saw a picture of the constellation character overlaid on the stars (and really paid attention to what I was looking at!) that I realized that the curvy part of the sickle is the head of the lion and Regulus is at the chest of the lion. Also, the name “Denebola” means “tail of the lion”, so the tail must be on the left side of the lion on our sky. The back end of the lion is made of a triangle of stars with Denebola at the far left point. The top star of the triangle is Zosma which means “girdle” because it is at the hip of the lion (and is another clue that the sickle part must be the front end of the lion). The bright point we call Regulus turns out to be four stars in a complex gravitational dance. The main star responsible for the great majority of the light we see from the system is a blue-white hot star much hotter than the sun still in the normal adult phase of its life but at an age of 250 million years, is nearing the end of it. Bigger, hotter stars shine very bright but live short lives (hmm…a life lesson for humans?). Regulus is spinning extremely fast, taking just 16 hours to spin once which compared to the 24.5 day rotation period of the sun, is very fast. It is spinning so fast that the equatorial diameter is 32 percent larger than the polar diameter. The temperature at the poles is 15,400 K (27,300 deg F) while the equator is only 10,200 K (17,900 deg F). By comparison, the sun is just 5800 K (10,000 deg F). The reason why Regulus is spinning so fast is found in the fact that it has a small white dwarf companion orbiting Regulus at about the same distance that Mercury orbits the sun. A white dwarf is the dead core remnant of a star. Since more massive stars live shorter lives than less massive stars, Regulus’ companion went through its entire life cycle quickly while Regulus puttered along. When the companion went through its dying stages, it would have bloated out into a red giant and transferred gas to Regulus. This transfer of gas spun up Regulus to tremendous speeds—Regulus’ equator is now spinning at 317 kilometers per second! Orbiting Regulus and its white dwarf companion is a binary star made of an orange star cooler than the sun and an even cooler red star. The two stars in the binary orbit each other in a large orbit about twice the size of Pluto’s orbit around the sun and they in turn orbit around the Regulus-white dwarf pair in an orbit that is at least 100 times the size of Pluto’s orbit around the sun. The habitable zone for the orange and red stars would be around each star individually and Regulus’ habitable zone would be around Regulus and its white dwarf companion. That means three sets of habitable zones in which exoplanets with ET astronomers to reside. That would make it easy for interstellar commerce. However, that scenario would require intelligent life to have developed almost 20 times quicker than it did on Earth. Another far out piece of news: tickets are on sale for “Black Holes” playing at the William M Thomas Planetarium on March 21 and for “Dawn of the Space Age” playing on March 28.